Welcome to Displays4Books. As authors of two novels we have our books on consignment in several locations. Unable to find suitable displays at a reasonable price we decided there needed to be a display to use in consignment sales. So with help from International Paper Co. we designed one. Our consignment sales have more than doubled using our new display boxes. Our sturdy cardboard two tier display box will hold 6 to 8 books (see dimensions). Print your message on a 6¼ x 6 inch card, glue it to the header and you have a great display. If you have two titles a booster snaps into the top tier to raise the back books higher. If you have 3 or 4 titles you can glue or tape two displays together as shown. Our minimum shipment is 10 units. Standard shipping is 3 - 5 days. Click Order Form to get started. We will call you within the next business day and process your order at that time. Your boxes arrive in single sheets with instructions, simply snap out and fold together. To help launch our product we are offering up to $20 off shipping costs. Please pass along our website to other writers. 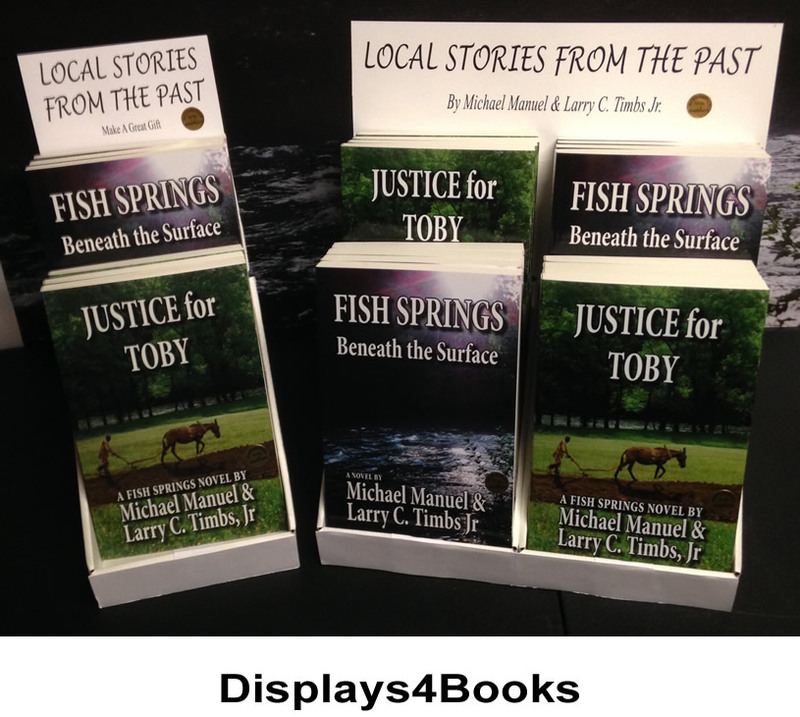 Authors, Michael Manuel & Larry Timbs Jr.
Countertop display using booster. Holds up to 8 books. Two displays joined together. Holds up to 16 books.